Last weekend I decided to try a new recipe. I had some leftover apples and wanted to make a dessert that might go good with coffee or tea on the side. So I searched online and found a recipe that sounded good, and I was right! These muffins are exactly what I wanted and turned out so delicious. 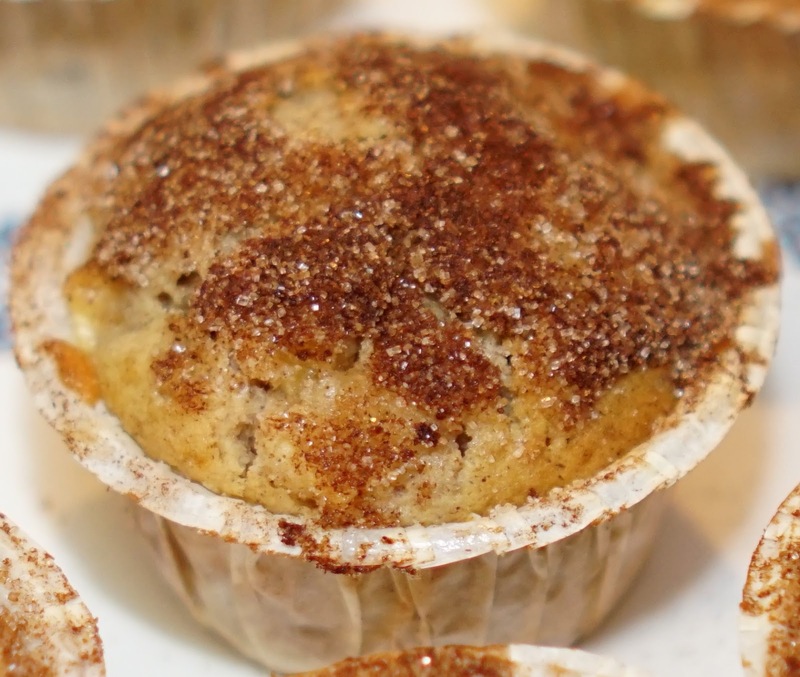 The cake is really moist and light with chunks of apples, cinnamon, sugar, and vanilla. I will definitely be making this recipe again. :o) If you want to try it out yourself, I will write the recipe below. The recipe makes 12 muffins. Sift or whisk together flour, baking powder, salt, and cinnamon in a medium bowl. Set aside. Note: If using vanilla sugar also add it to the flour mixture. Dice apples, and in a separate bowl toss apples together with 2 tsp. of flour, and 1/2 tsp. cinnamon. Set aside. In a large bowl, cream together softened butter and sugar until lightened in color, about 3 minutes. Add an egg, one at a time, taking care to fully incorporate before adding the other. Mix in vanilla (if using vanilla extract). Tip: If butter is not softened you can grate it and then mix with sugar. Gently fold in flour mixture, alternating with milk just until combined. Then, fold in diced apples. Scoop mixture into prepared muffin tin, filling about 2/3 to 3/4 full. Bake until a toothpick inserted in the middle comes out clean, about 30 minutes. Prepare topping for muffins while the muffins are baking by melting the butter and allowing it to cool slightly. Then, mix together granulated sugar and cinnamon in a separate bowl and set aside. Once muffins have baked, remove from the oven and allow to cool slightly in the muffin tin. Then remove each muffin, brush each muffin top with butter, and then dip the top in the cinnamon/sugar mixture, one by one. Place onto a plate to finish cooling.